Peace and Conflict Studies is happy to co-sponsor this event! 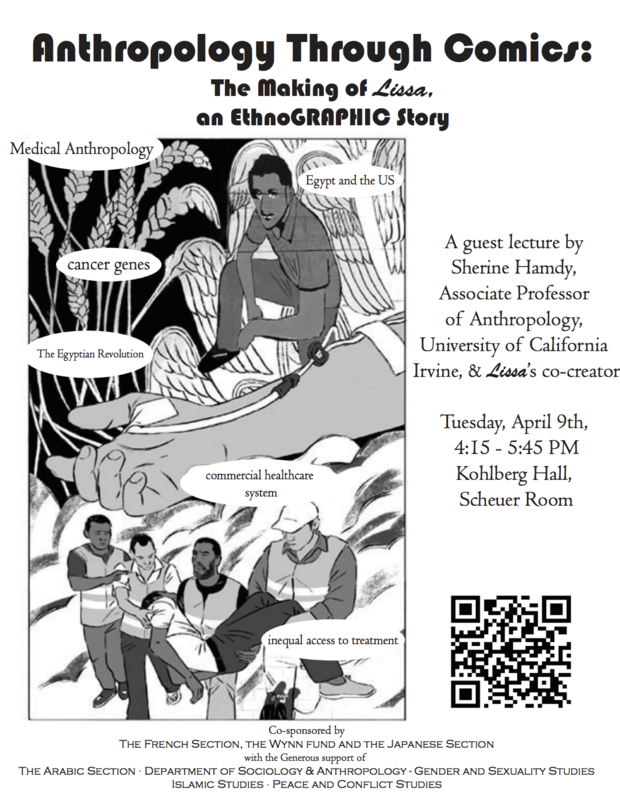 Sherine Hamdy will discuss her move from medical anthropological research to working on creating a graphic novel, featuring women from extraordinarily different circumstances each facing a medical decision the other can’t understand. Lissa, which takes place against the backdrop of Egypt’s popular uprisings, is informed by Hamdy’s ethnographic research in Egypt on the vulnerabilities that expose people to kidney and liver disease, and the difficulties of accessing proper treatment. The work also draws on Coleman Nye’s research in the U.S. on the social and political calculus of managing genetic risk for breast and ovarian cancer within a commercial healthcare system. Previous Post“Symbolic and Material Boundary Drawing in the Syrian Refugee Crises: Excluding Muslim Men from Germany” with Dr. Gokce YurdakulNext PostConversation with Max Elbaum, longtime left organizer and author of Revolution in the Air: Sixties Radicals Turn to Lenin, Mao and Che.